Sure Step 2 is manufactured from a rotocast of UV-stabilized and recyclable high-impact material (HDPE). The Sure Step 2 is designed to withstand the most severe weather conditions year after year, with zero-maintenance effort and expense. 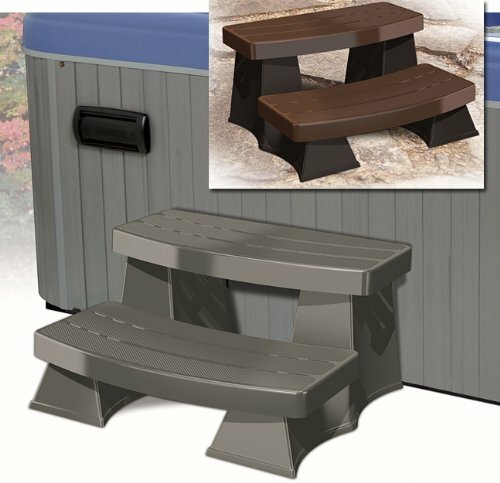 Its attractive simulated wood grain finish provides a slip-free surface upon which to step, while self-leveling cushioned pads provide surface protection and keep Sure Step 2 in position next to your hot tub spa. If you have any questions about this product by Byron Originals, contact us by completing and submitting the form below. If you are looking for a specif part number, please include it with your message.